Outcome: Approved, provided that the purchase is postponed until the first soldering based class is actually scheduled. Guan can personally decide to lend Hack Manhattan sums necessary to pay rent, with a balance not exceeding $1,000 at any point in time, at zero interest but otherwise on terms that Guan decides. Guan can unilaterally decide to move Hack Manhattan out of the building if we can't pay rent. There's a main event going on. Quiet conversations can take place anywhere. Ask before being loud in the machine shop. Example: a class. There's an event going on, but any conversation is acceptable. Example: a meetup or Tech Tuesday event. Everyone must be completely quiet. Only quiet work can go on. Example: film viewing, event with main speaker/panel. 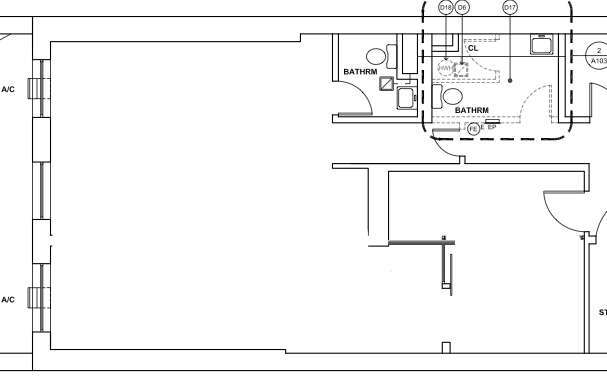 If the "one room solution" is adopted, so the entire wall is removed, all of the plans below for how to expand the plexiglass machine shop room are acceptable, including minor variations. Whoever does the work can decide which plan to adopt. Outcome: Justin Levinson was elected President. David Reeves was elected to fill the vacant position of Director-at-Large. See Studio D for practical information about the expansion. Outcome: Option 2 was approved. A hole will be made in the wall that's just large enough to fit the large worktable and some space to walk around it. Since part of the wall is retained, the 3D printer desk (or something else) could stay where it is, against a wall. We remove as much wall as we can so the room is as large as possible. 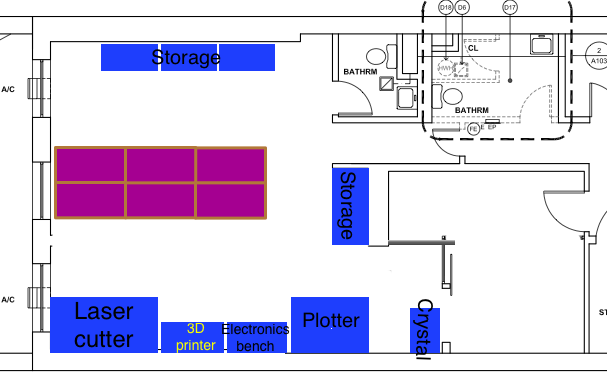 Specialized workspaces such as the 3D printer will be along the walls, at both ends of the room or in other areas. There are huge psychological benefits to having one big room where it's easy to see what everyone else is doing and for visitors to see what tools are available and what people are working on. It is more inviting to visitors because they don't feel that they need special permission or a reason to look around every corner of the room. (See: NYC Resistor.) In the current space, it often takes a considerable amount of effort to convince first-time visitors to go beyond the area in front of the plexiglass room. If we retain the feeling of two separate rooms, we are not getting full value from the expansion. 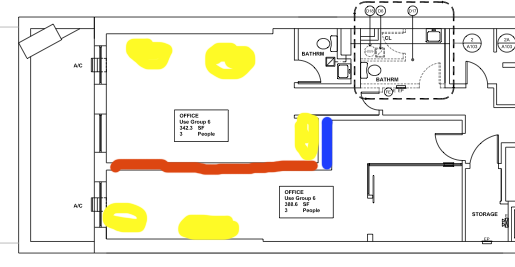 We will just get two rooms that are just as crowded as before, if not more. We are often very understaffed on Tuesday nights and open houses when it comes to greeting visitors and introducing them to hackerspaces in general and Hack Manhattan in particular. Having an open layout will encourage more visitors to walk around on a kind of self guided tour so they need less handholding and encouragement to look around. For example, all visitors would instantly see that we have a 3D printer, rather than have to be dragged over to see it. We can't just start with a smaller opening and making it bigger later if necessary. We are planning a large open house in mid April. If visitors who visit us then don't feel welcome or don't get a complete impression of what Hack Manhattan does, they may never come back. We would waste a big chance to make Hack Manhattan feel more open and accessible. We absolutely need more members to pay for the new space. Without the largest possible space, it will be much more difficult to attract new members. There will still be plenty of space for dirty work in the plexiglass room. 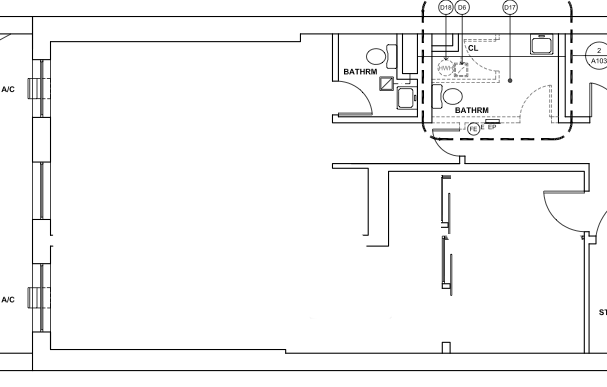 If we determine that the plexiglass room is not big enough, we can consider expanding it. Having a smaller opening will provide some noise isolation but very little dust isolation if woodwork is being done on the other side. The ability to have multiple simultaneous activities is illustory because the rooms are simply too small. If a class is being taught in one half, it will still disturb a different class or event in the other half. There will not be enough space in Studio D to have both shelving units and a large work table. 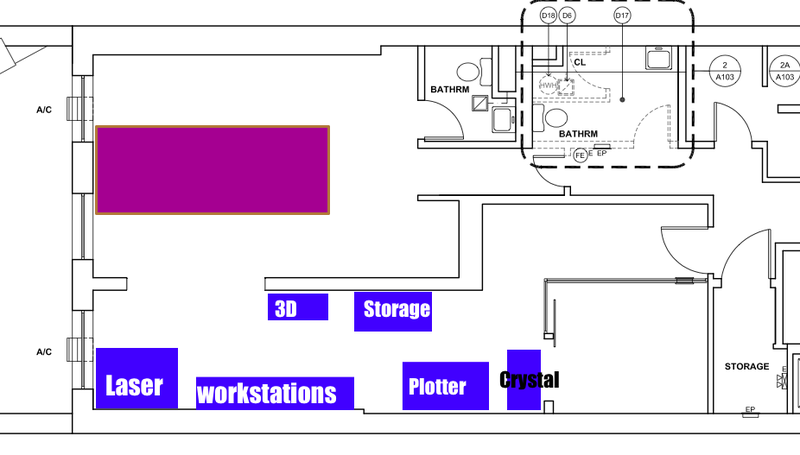 If we cannot move the shelving units into the current Studio D, it will be hard to expand the plexiglass machine shop. That will in turn make it difficult to create enough machine shop space because there is nowhere to move the big wooden machine shop table. 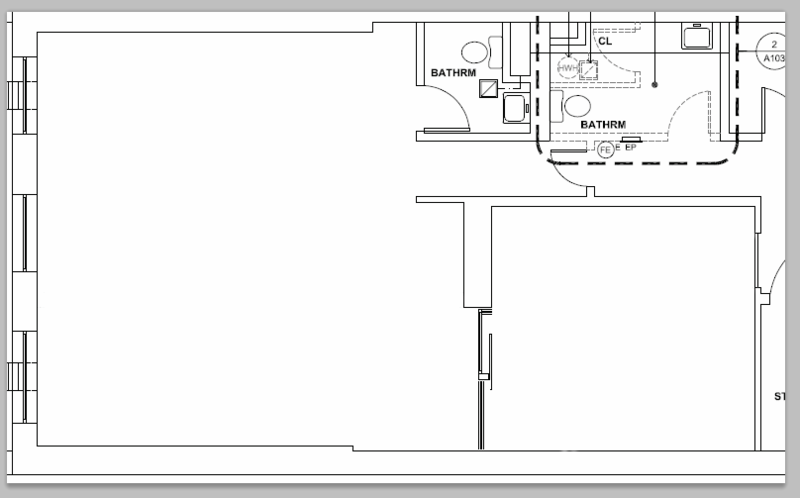 This is also why all the wall has to come down: only then can the large central work table be moved sufficiently far west for there to be shelving units on the eastern wall of Studio D.
The problem is that the existing space will be just as crowded and cramped as before. Studio D will be okay if we don't put any storage in there, but will not feel spacious. (If we do put shelving units in Studio D, it will feel cramped again. Alternatively we could have a smaller main work table, which isn't good either.) On an open night, if most visitors come in to Studio D, it will be hard to convince them to go into the smaller room and look around. We again have a problem that someone might visit Hack Manhattan without even being aware that we have a 3D printer, for example. All of the current space is used for dirty machine shop. Little or no entry is possible between current space and Studio D.
The current fairly narrow door to Studio D will be our main entrance. The eastern plexiglass wall will be removed in all plans. Plan A: The current northern plexiglass wall will be moved a few feet north to where the windowfarms are currently placed. 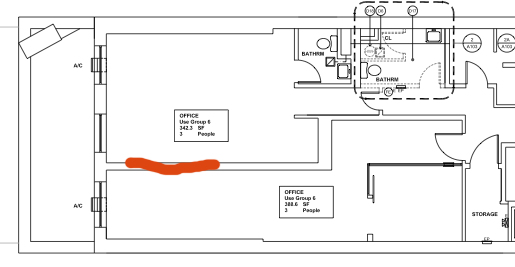 Plan B: The current northern plexiglass wall extended eastward to close off the current entrance hallway/shelving. Plan D: Punt on the decision. Declare all the plans acceptable and let whoever will do the work decide. Plan B would leave a little alcove if the we don't take down the windowfarm wall, and would provide less space for the machine shop and more to the main space. Our current main door will still be available to move large objects in through the machine shop. It could also be an emergency exit, allowing us to put a fail secure magnetic lock on the new main entrance door. This change would probably take place over the coming months, not immediately after the expansion. Thomas Dukleth was admitted as a member. This page was last modified on 27 March 2013, at 14:29. This page has been accessed 103,172 times.